You'll love having this five piece gathering table and chair set in your home for it's simple yet stylish take on urban rustic design. Each piece boasts a deep espresso finish that pairs beautifully with the brown/tan fabric on the chairs. 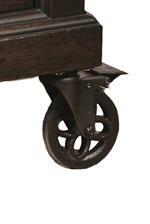 The table also features decorative metal brackets on the legs to add that subtle touch of urban industrial flair. Furthermore, the table includes an 18" table leaf to extend the surface from 62" to 80" so you can seat even more of your friends and family. The Fulton Street 5 Piece Gathering Leg Table and Upholstered Chair Set by Samuel Lawrence at AHFA in the area. Product availability may vary. Contact us for the most current availability on this product.